Wild-collected; found near Moughton north of Settle, Yorkshire, England, before 1935; introduced by Maxwell & Beale (Broadstone, Dorset) in 1935 originally using the cultivar name 'Mrs J. H. Hamilton'. The name was changed in 1936 by the nursery. Presumed to have been named after the finder, J. H. Hamilton, a director of Maxwell & Beale. Mauve (H2) flowers, VIII–IX; downy grey foliage; spreading habit; height 10–15cm; spread 26–30cm. One of the best grey heathers. Seedling; found by J. B. A. Dekker (Mijdrecht, Netherlands) by 1974; introduced by P.G. Zwijnenburg (Boskoop, Netherlands) in 1974. Mauve (H2) flowers, XI–I(–V but very rarely); dark green foliage; height 26–30cm; spread 31–45cm. Unusual, but not of great garden value. Named after both the finder, Mrs J. Longstaffe, and the month when found. ❁ Double flowers darker red than 'Annemarie'; IX–X; dark green foliage; height 46–60cm; spread 46–60cm. Sport on 'Annemarie'; found by Jürgen de Vries (Apen, Germany); introduced in 1998. White flowers, fading to pale lavender, VII–IX; mid-green foliage; vigorous; height 26–30cm; spread 46–60cm. Pruning is essential to keep a tidy plant. Outstanding in The Heather Society Trials. Named after the second child of Charles Chapman (Birmingham, England). ♤ Bud-flowering; buds amethyst (H1), to 5mm long; VIII-XII; foliage dark green with paler new growth; habit spreading and hanging; height 10cm; spread 25cm after 3 years (pruned). Sport on ‘Amethyst’ found by Gerhard Martens, Kalkar, in autumn 2010 between unnamed seedlings, selected in 2008. Has bigger buds than ‘Madonna’ and is more resistant against fungi. ® C.2013:02 registered on 17 March 2013 by K. Kramer, Edewecht-Süddorf, Germany. White flowers, VIII–IX; dark green foliage flecked with cream; height 31–45cm; spread 31–45cm. The variegation is attractive but there is a tendency for it to be lost on propagation. Acquired in Japan in the 1970s by Kurt Kramer (Edewecht-Süddorf, Germany); introduced by Kramer about 1979. Name alluding to the flower colour and country whence it was acquired. Lavender (H3) flowers, VIII–IX; straw-gold foliage in summer, deepening to orange-gold in winter; height 16–20cm; spread 31–45cm. Named after John Letts's dog! ♤ Bud-bloomer, bright red; VIII-XI; foliage bright green; habit broad, upright. Sport on 'Anette'; found in 2000 by Heinz Tuber (Siidlohner Damm 15, Gescher). Registered on 8 July 2003 by Kurt Kramer. Mauve (H2) flowers, VIII–IX; grey-green foliage, young shoots tipped cream and pink in spring; low, spreading; height 10–15cm; spread 21–25cm. A sport on 'Sister Anne', found by Mr S. Crabtree, Eversley Nurseries, Hesketh Bank, near Preston,, before 1993. ❁ Lilac-pink (H11) flowers, IX–XI; dark green foliage turning bronze in winter; height 16–20cm; spread 26–30cm. Good double, much under–rated. More disease resistant than most of the double pink Callunas. Wild-collected; found by J. W. Dyce on Winterton Dunes, Norfolk, England, on 19 September 1971 while leading a party from the British Pteridological Society; propagated and introduced by Foxhollow Nursery, Windlesham, Surrey. Named after J. W. Dyce who was a leading member and honorary secretary of the British Pteridological Society. Double mauve (H2) flowers, IX–X; bright green foliage even in winter; neat; good ground-cover; height 16–20cm; spread 26–30cm. Sport on 'Alba Plena'; found by J. W. Sparkes (Beechwood Nursery, Beoley, Redditch, Worcestershire, England); introduced by J. W. Sparkes in 1950. Named after the daughter of J. W. Sparkes. Rosy purple flowers, VIII–IX; dark green foliage; compact; height 21–25cm; spread 31–45cm. Introduced by Jürgen Krebs (Hoyerhagen, Germany) and named after his first apprentice, Jochen Stelling. Deep purple-red flowers, VIII–IX; orange-yellow foliage turning orange-red in winter; open habit; height 21–25cm; spread 46–60cm. A seedling found growing near a plant of 'Sir John Charrington' by A.G. Siegers at his nursery in Holland in 1992. Named after the son of the introducer. Lavender (H3) flowers, IX–X; gold foliage in summer, turning bronze in autumn, then red and orange in winter; prostrate habit; height 10–15cm; spread 21–25cm. Very similar to 'Golden Carpet'. Seedling in a bed of 'Mrs Ronald Gray'; found by John F. Letts (Foxhollow, Windlesham, Surrey, England) in 1960s; introduced by B. and V. Proudley (Aldenham Nursery, Watford, Hertfordshire) in 1968. 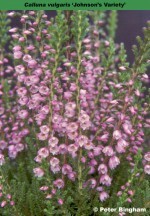 Named after the well-known heather nurseryman of Windlesham, Surrey. Lavender (H3) flowers, X–I; mid-green foliage; upright; height 26–30cm; spread 46–60cm. An outstanding late-flowering ling found by Arthur Johnson near Hyères in southern France in February 1927. White flowers, VIII–IX; lemon-yellow foliage, becoming lemon-green in winter; broad, upright compact habit; height 31–45cm; spread 31–45cm. Registered 23 December 1993: J. G. Flecken, Kerkrade, Netherlands. White flowers, VIII–IX; dark green foliage, young shoots with light green tips in spring; dwarf with upright branches; height 10–15cm; spread 16–20cm. Seedling found by Jos Flecken in his garden at Kerkrade, Netherlands, in 1991. White flowers, VIII–IX; bright green foliage; neat, erect, compact habit; height 21–25cm; spread 31–45cm. A seedling introduced by K. Kramer (Edewecht-Süddorf, Germany) in 1993 from his extensive breeding programme. Named after the sister-in-law of Anne Beirmann, friend of Kurt Kramer. White flowers, VIII–X; mid-green foliage; height 10–15cm; spread 26–30cm. 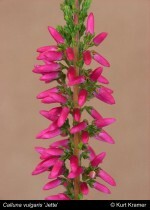 The plant, when found on the Isle of Lewis, Scotland, had spikes of pink and white flowers, hence its name, but this characteristic was soon lost. Wild-collected; found in the Uig area on the wast coast of the Isle of Lewis in 1971 by William S. Dobson (Edinburgh, Scotland); introduced by J. Ponton (Kirknewton, Midlothian, Scotland) in 1972. Name is an allusion to the pink and white flowers, and the loss of this characteristic; from the Biblical story. ❁ Bright red flowers; VIII-IX; foliage dark green; habit erect; height 30cm; spread 40cm. Lavender (H3) flowers, VIII–IX; straw-coloured foliage in summer, turning orange in winter; height 26–30cm; spread 46–60cm. A beautiful but under-rated, plant. Found by J. W. Sparkes (Beechwood Nursey, Beoley, Redditch, Worcestershire, England); introduced by J.W. Sparkes by 1963. Named after Mrs Vanstone (Lowson Ford, Warwickshire), wife of Jack Vanstone, director of H.V. White, flower sellers, of Birmingham. Flowers heliotrope (H12), single; IX-X; foliage bright yellow in summer, with bright yellow young growth; habit upright, bushy; height 30cm; spread 30cm across after 4 years. Selected from mixed seedlings, raised from open-pollinated plants. 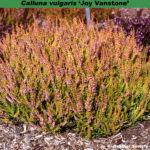 "No other Calluna cultivar as this combination of heliotrope flowers and soft yellow foliage." Judy loved heather and she loved Sweden. She deserved to be commemorated by a beautiful Swedish plant. 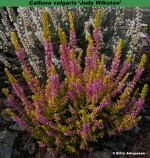 Published in the Bulletin of The Heather Society 8 (6: Autumn 2015): 10-11, front cover; URL www.heathersociety.org/new-heathers (posted 24 October 2015). ® C.2015.08 registered on 21 September 2015 by Brita Johansson, Musselvägen 3, 46834 Vargön, Sweden. Lavender flowers, VIII–IX; gold foliage in summer, turning orange with red tints in winter; compact, upright; height 26–30cm; spread 46–60cm. ♤ Bud-flowering; calyx red; VIII-XII; foliage dark green; habit upright. Late blooming with long durability. Deliberately bred seedling from 'Amethyst' and "97-18-15"; raised and selected by Kurt Kramer. ® C.2006:08 registered 25 December 2006 by Kurt Kramer, Edewecht, Germany. Lilac flowers, VIII–IX; grey-green foliage, young shoots tipped pink and yellow in spring; erect; height 21–25cm; spread 31–45cm. Found by Jack Platt (Ulnes Walton, Leyland, Lancashire, England) before 1977. Flowering is very early in the season, dying off before many of my "normal" Calluna come into flower; and spring tips develop into bright red branches until the appearance of buds signals a return to more normal dark green. Plants attain about 20cms tall x 40cms across after three years. Named 'Julie Bradbury' in recognition of the very helpful Brentwood Farm Nursery at Charlesworth. Unfortunately, the nursery no longer deals with heathers, having grown a couple of dozen cuttings for me, so it looks as though it will not be developed, the only plants being in my own garden and that of a neighbour. ♤ Bud-flowering, rose-pink (H7), colour between ‘Anette’ and ‘Jette’; buds 4mm × 1.5mm; VIII-XII; foliage light green; habit bushy; height 25cm; spread 30cm after 3 years. Sport on ‘Anette’ found by Wilfred Holzwart, Hoisdorf, in Autumn 2007. ® C.2011:01 registered on 16 January 2011 by K. Kramer, Edewecht, Germany. Mauve (H2) flowers, VII–IX; soft, mossy, dark green foliage; forms a neat mound; height 26–30cm; spread 31–45cm. Raised by Walter Kolaga (proprietor of Mayfair Nurseries, Nichols, New York, USA) and named after his wife, June.